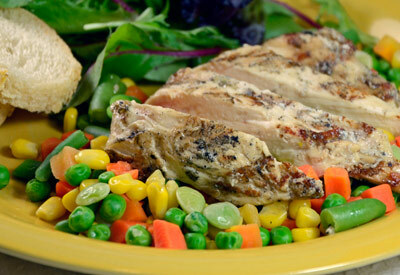 Marinate chicken breasts in Italian herb dressing; cover and refrigerate for at least 2 hours or up to 24 hours. Preheat grill to medium high heat or set oven to broil. Remove chicken from marinade (discard leftover marinade) and grill or broil for about 6 to 7 minutes per side, or until chicken is cooked through and no longer pink inside. Serve chicken breasts atop bed of vegetables.